Shipping Leadtime: 1-3 business days. Constructed of cast iron with a corrosion resistant finish. Bolt Pattern: 9-1/2" on center bolt pattern. Fits: Zurn Z100 / P100 series drains. Design includes strategically placed slots allowing versatile securing arrangements to various roof decks. 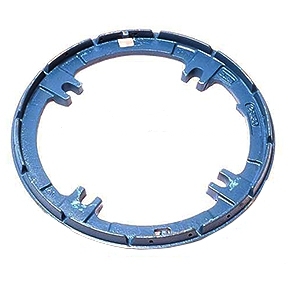 Zurn manufactures replacement clamp rings for all main roof drain sizes - Z100, Z121, Z125 [8", 12" and 15"] Zurn drains. 12.5 INCH O.D. ZURN Z100P REPLACEMENT POLY DRAIN DOME / STRAINER. FITS Z100 15 INCH DRAINS. PRICE/EACH.